In 1872 the First International, the International Workingmen’s Associa-tion founded by Marx and Engels, decided to transfer the seat of the General Council from London to New York, thereby, as Engels said, “withdrawing for the time being from the stage,” and in fact dissolving its organisation. At that time Marx and Engels saw that there was no possibility of the International carrying on effective work, for, with the bitter persecution which prevailed then, it would have demanded the greatest sacrifices. The French working class movement had been crippled for years by the defeat of the Commune; the Eng-lish trade union leaders had withdrawn from the International because of the General Council’s support of the Commune; in the less developed capitalist countries the movement had been disrupted by the efforts of the anarchists under Bakunin‘s leadership. The First International was a revolutionary propa-gandist organisation which rallied the most advanced workers in all countries under the slogan of proletarian class struggle. Amidst the storms of the Franco-German War and the Paris Commune, its representatives had stood the test of revolutionary internationalism. When, after the defeat of the Commune, reaction triumphed, Marx and Engels considered it inexpedient to maintain the formal existence of the organisation, but they had not the slightest intention of giving up the principle of the international union of the proletariat, which formed the foundation of their life work. They wished to await conditions more favourable to the revival of the international working class movement. By the ‘eighties these conditions had come into being. In the heroic struggle against the anti-socialist laws, after the initial hesitation of the “whim-perers” — to use an expression of Engels‘ — among the leadership had been overcome, German Social Democracy had been strengthened and had won great influence over the masses. The number of votes given to the Social De-mocrats had risen from 437,000 in 1878 — the year of the anti-socialist laws — to 763,000 in 1887. The influence of socialist groups was growing in the English trade unions, which were beginning to resist the reformist leaders who were making the working class movement an appendage of the Liberal Party. In France the labour movement was developing on a broad basis, accompanied by vigorous contests between the left wing, led by the Marxists Guesde and Lafar-gue, and the Blanquists under Vaillant on the one side, and the right oppor-tunist wing, the “Possibilists,” under the leadership of Brousse, on the other. At their Congress in Haifeld in 1888—89, the Austrian Social Democrats had united under Victor Adler. Thus in the most important capitalist countries the conditions necessary for the development of socialist mass organisations were present. The convening of an international congress became a question hotly dis-puted between the revolutionary and the reformist wings of the international working class movement. 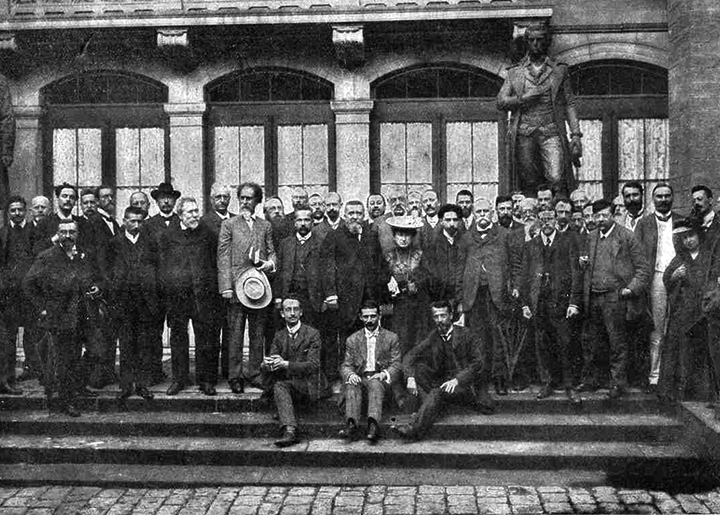 The French Possibilists and the English trade union leaders consented to participate in an international congress at Paris only on conditions which would have made it impossible for the Austrian and German Social Democrats to attend. It was obvious that the French opportunists were anxious to make use of an international congress, in which the majority would have been of their way of thinking, for the purposes of their struggle against the Marxists in France. Although this scheme was generally recognised, the leaders of the right wing of the German Social Democrats, Auer and SchippeI, were willing to submit to the plans of the Possibilists. ( Cf. Letters from Becker, Dietzgen, Engels, Marx and Others to Sorge p. 311 (German). 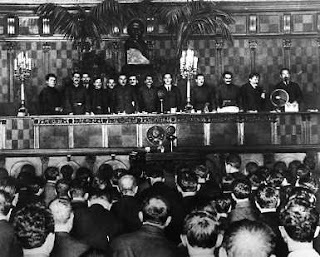 The Leaders of the Ger-man Party, Liebknecht and Bebel, on the other hand, tried to persuade the dif-ferent groups among the French Social Democrats to unite in convening the Congress. Their efforts met with no success and, on the opening of the World Exhibition held at Paris, in celebration of the hundredth anniversary of the storming of the Bastille — July 14, 1889 — two Congresses met at Paris, the Congress of Possibilists, dominated by the reformist representatives of the French and English trade unions, which did not bear an international charac-ter, and the Congress of Marxists, at which the revolutionary socialists of twenty important capitalist countries were represented. As revolutionary socialists, the delegates to the Inaugural Congress had to define their attitude to reformism and to anarchism. At that time, when the mass organisations of the proletariat were beginning to develop, anarchism represented the petty-bourgeois influence among the proletariat; it expressed a lack of faith in the strength of the masses, a reliance on the effectiveness of in-dividual action. The anarchist representatives at the Paris Congress declared themselves opposed to the working class’s taking over political power, for that was bound to lead to new forms of oppression. They condemned legislation for labour protection, which was one of the most important points discussed at the Congress, as an anti-socialist bourgeois affair. Their ideas found support among a few French syndicalists, and the Italian and English anarchists. The great majority decisively rejected them. From the beginning the attitude of the anarchist representatives had been, not that of comrades anxious to convince the others of the correctness of their convictions, but that of enemies, eager to create disruption in the hostile camp. They were accordingly treated in that fashion by the Congress and, on their refusal to submit to the agenda, ejected from the hall. Thus the separation from the anarchists was practically completed at the Inaugural Congress, and needed only to be fully confirmed at future Con-gresses; but the position of the reformists within the Second International was never thoroughly and adequately defined in the whole course of its existence. The question arose in practical form at the Inaugural Congress in the proposal to unite with the Possibilist Congress, which was sitting at the same time. The great majority of the delegates were in favour of amalgamation. The notorious Gompers, leader of the arch-reactionary American Federation of Labor, sent an address of greetings, in which he urgently recommended union with the Possi-bilists. Only a few delegates were fundamentally opposed to this course. 1 The name given at that time to adherents of the Society for the Rights of Man, an association which united republicans of all shades against monarchist reaction. Founded in the Rue Cadet, Paris, its members and the French government parties were called Cadettists. Even the English poet William Morris, who was closer to the anarchists than the Marxists, spoke in the same strain, as did also German delegates from Berlin and Dresden. Wilhelm Liebknecht was opposed to unconditional amal-gamation, and moved a resolution in favour of amalgamation on condition that the other congress should put forward acceptable conditions. The proposal was voted upon according to national groups, and passed by twelve votes; only Norway and Sweden voted for the complete rejection of any amalgamation, while the French delegation declared that they had voted for Liebknecht‘s reso-lution only for the sake of unity. Amalgamation did not take place because the Possibilists would agree only on condition that they should have the right to decide on the validity of the mandates. 1 Letters from Becker, etc., to Sorge, p. 317. At the time, therefore, Engels saw no danger in union with the reform-ists, so long as the superiority of the Marxists was assured. Such an attitude was quite justified at that stage of the movement. For not only parties, but trade unions, were represented at the Congress. For example, Keir Hardie rep-resented 50,000 organised Scottish miners. The majority of the French dele-gates represented local trade unions, and both parties and trade unions were represented in the German and Austrian delegations. To have admitted only those organisations which took their stand on the basis of the revolutionary class struggle would have meant excluding the mass organisations of the prole-tariat at a time when the real need of the day was not direct revolutionary ac-tion, but rallying the masses and winning them to socialism. In his opening speech, in which he declared that the Congress was carry-ing on the work of the International Workingmen’s Association, Wilhelm Liebknecht stated: “The international labour movement has become too great to be kept within the bounds of a single united organisation.” That was indeed making a virtue of necessity. At the beginning of a new period of advance in the working class movement, when socialist mass parties and trade unions were just developing and the working class was not yet capable of international ac-tion, it was impossible to make unanimity on all important questions the con-dition of adherence to an international organisation. Unanimity in theory and practice must be the result of the struggle for the principles of revolutionary Marxism within a broad international organisation. But to renounce unity in the international because of the breadth of the movement is to renounce its ac-tual purpose — united international proletarian action. “A great international demonstration must be organised to take place at a certain time and in such a manner that simultane-ously the workers in every country and every town should demand of the public authorities the limitation of the working day to eight hours and the operation of the other decisions of the Paris Interna-tional Congress. “In view of the fact that the American Federation of Labor at its Congress held in St. Louis in December 1888 decided to hold such a demonstration on the First of May 1890, that day is ac-cepted as the day for the international demonstration. Since the greater part of the time at the Congress was taken up by the question of unity with the Possibilists and by reports on the position of the movement in the different countries, there was no opportunity for a thorough discussion of these resolutions or of a number of other important decisions which were taken. They were voted upon without discussion, only explanations being allowed. Resolutions were passed on the abolition of standing armies, on the arming of the people, on the eight hour day and labour protection, on the struggle for political power “by means of the ballot box” but “to the exclusion of any compromise whatever with other political parties.” A proposal from the French delegation for the general strike as “the beginning of the socialist revo-lution” was defeated after Liebknecht had spoken against it.